Being the Air Force guy that I am, I used to find it hard sometimes to share stories of other branches of the military. But over the years and after many military history programs, I have softened up, to say the least, and now enjoy sharing the service history of all those men and women who have made great contributions to America and our Valley. The Los Angeles County Air Show this year is remembering the sacrifice and gallantry of the soldiers and seamen of Pearl Harbor. 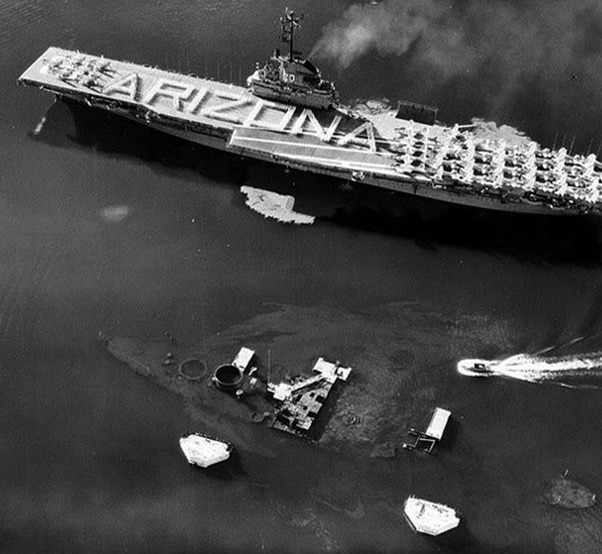 This year is the 75th anniversary year of the “date which will live in infamy” — Dec. 7, 1941. 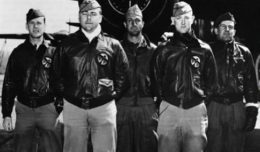 Each morning of the air show, a history panel with some of these 90-year-old survivors will be joined by other World War II veterans who were the avengers of that fateful morning. The window of opportunity to interact with these legendary soldiers is quickly coming to an end, as that generation writes its final chapter for the history books. We are blessed to still have these few remaining opportunities to learn directly from them. But with the passing of time and these veterans telling their stories, let’s pause and reflect on the stories we never heard. The casualties on Dec. 7 were in the thousands; the stories of those lost on that day would fill a book that would take a lifetime to read and digest. For the short time they lived, these brave combatants showed us the very best of American heroism, while at the same time experiencing the horrors of war. This leads me to the story of one of these very special young men. A young man who was born in 1920 in Illinois to a mother named Sara would never get the chance to see or hear the incredible story that would forever have him instilled in the conscience and the fabric of America. 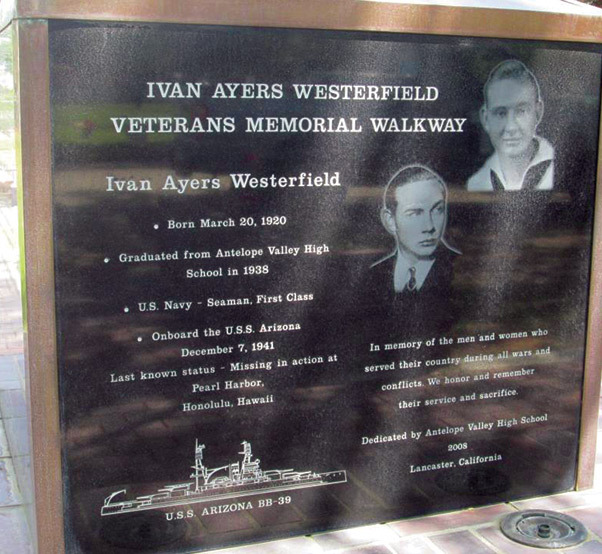 In 1938, Ivan Ayers Westerfield would hear his name called out in an auditorium at Antelope Valley High school and would walk forward to receive his high school diploma. His mother, who was a widow at the time, shared the excitement as she watched her son shake hands and receive the document that said he was ready to take on the world. For a while he worked odd jobs around the Antelope Valley, but something else was calling him — service to his country on the high seas with the United States Navy was the home calling him, and he would have that home for the rest of his short life. Sunday morning on Dec. 7, Ivan Westerfield found himself in the middle of mass confusion as the ship’s alarm and calls to battle station caught him and the rest of the crew off guard, as the nation not at war was being fired upon by an unknown enemy. As Ivan and the rest of the crew scrambled to take up the fight, little did they know that within a few minutes many these sailors would be destined to spend eternity together. Ivan and his shipmates found themselves at ground zero in the battle at hand, for they all had the distinction of serving aboard the USS Arizona. In that moment in time, this 1938 Antelope Valley High School graduate became one of the very first casualties of World War II. We have no way of knowing what those final few minutes looked like for Ivan, or if he even knew whether it was a drill or an attack, or if he was even aware of who was doing the attacking. 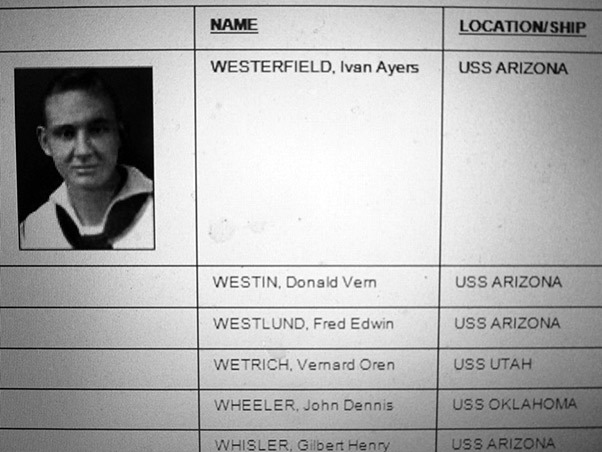 For me personally, when I have visited the Arizona and looked on that marble wall and I see the name of Ivan Ayers Westerfield, I find myself staring down at the ship and wondering about all those men and what those last few moments looked like for all of them. I will never know, and the thousands that share my experience visiting the memorial will never know either. But we do know that their deaths were not in vain and that that the silence emanating from the Arizona Memorial is, in itself, a very loud message that we should never forget: that the men and women who serve our nation in times of war as well as times of peace are always in harm’s way and that those men and women are our children who are graduating from small-town schools all across America. I hope to see you all at our Valley’s air show as we “Remember” March 19 and 20. As the smoke rises from the living history lesson we’ll witness in the skies during the aerial reenactment of the attack on Pearl Harbor, let us look in the direction of Lancaster and remember a young man from our Valley who, for a brief moment in time, made history as one of our home town boys.